Martinez has more than just a plan B. Plan C, D and E is ready when necessary!!! 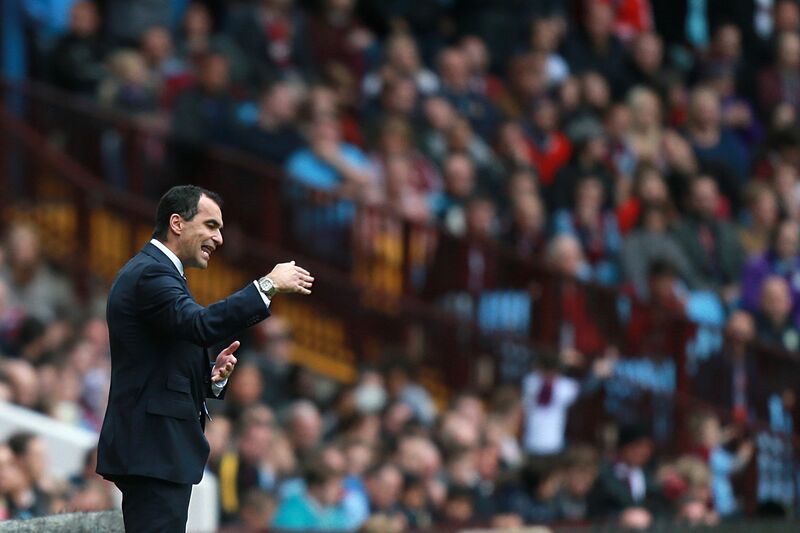 A few days have passed since Everton returned from Villa Park with three points in the bag, providing ample time to sit back and reflect on how impressive a result this was for Roberto Martinez and his Everton side. Despite Villa struggling at home during the last 15 months, it is impossible to ignore Everton’s poor record at Villa Park, with just 2 wins prior to Saturday since the inauguration of the Premier League in 1992. The eventual ease at which the Blues picked up the three points is made all the more pleasing by the difficulties Everton have incurred against Villa over the last 21 years. If the end result was comfortably secured, the first half was anything but a breeze, as Everton had goalkeeper and undoubted man of the match Tim Howard to thank for keeping a bright and vibrant Villa attack at bay. Boosted by the return of brilliant Belgium Christian Benteke, Villa flew out of the blocks and attacked Everton with gusto. With Benteke and Weimann flanked by Gabby Agbonlahor the scourge of Everton for a number of years and Bulgarian winger Aleksander Tonev, the Yellow and Blue shirted Everton looked dazzled and it certainly wasn’t a surprise when the initial pressure paid off with the award of a penalty kick to Villa. With the entire ground expecting the net to ripple, Howard pulled off a tremendous save to maintain his precious clean sheet, stretching an arm up high to deflect the ball over and wide. That certainly wasn’t the end of the Villa onslaught and aided by some dubious officiating from the referee’s assistant, Benteke and Weimann were denied by the inspired American goalkeeper. Undoubtedly the biggest plus to come out of the last two matches has been the way Everton have adapted to the tactical approach of the opposition. It is therefore with great surprise that more than one local radio station has questioned whether Martinez has a plan B. He clearly has far more; with plan C, D and E ready to be employed if necessary to ensure Everton maintain their onslaught at the top of the Premier League table. Saturday’s victory was testament to this, as the first half progressed and until Everton took hold of the game in the second half, Martinez made a number of subtle alterations to ensure the Blues were able to take a stranglehold on the game. Gareth Barry started to sit deeper, at times slotting between Jagielka and Distin to collect the ball and to ensure possession was retained in a calm and organised manner. Baines and Coleman restrained their normal attacking instincts to nullify the threat of the four man Villa attack, with McCarthy, Barkley and eventually Osman, expected to link play with Everton’s wide men. The arrival of Osman on the hour was instrumental in securing the three points, with the much maligned midfielder assisting the first and scoring the second goal on a victorious afternoon. Osman relished the opportunity to play just behind the effervescent Lukaku and with Villa containing Barkley’s running and dribbling; it was the former England man who was able to push Everton forward with his brilliant and incisive passing. It is not through luck that Martinez has made game changing substitutions in three of the last 5 matches, with Lukaku and McCarthy transforming Everton at West Ham, Pienaar scoring the winner at home to Hull and now Osman making the difference at Villa. His bravery has been rewarded, but his ability to read a game while it is in full flow and to identify areas and players who can make a difference have helped Everton to three wins, in games under a previous regime which would have drifted to an inevitable draw or defeat. You don’t need to look far to see how it could have been, across in Manchester the frustrated United fans are bombarding radio phone-ins and message boards with angst due to the negativity transpiring from the Old Trafford dug-out. Having made the necessary adaptations the second half was a completely different football match. The Yellow and Blues now seized control and squeezed the life out of Lambert’s Villa with an assured possession game. Firstly a flowing passing move ended with Osman squaring the ball for Lukaku to stroke the ball low into the corner of Guzan’s net. With Everton now full of confidence, a short corner routine left Barry in acres of space and when he pulled the ball back to the edge of the box, the dose was repeated, with Osman placing the ball into the same corner as Lukaku. With the three points secured, Martinez will have immediately turned his thoughts to Spurs and AVB, with Everton looking to close the gap on the teams at the top with another Goodison victory. Team: Howard; Baines, Coleman, Jagielka, Distin; Barry, McCarthy, Barkley (Osman); Pienaar (Naismith), Mirallas (Deulofeu), Lukaku. Next Post How would Everton fare in the Champions League?